Both aircraft crashed into the sea off the island of Iwakuni. The incident happened about 2am local time (4am AEDT). 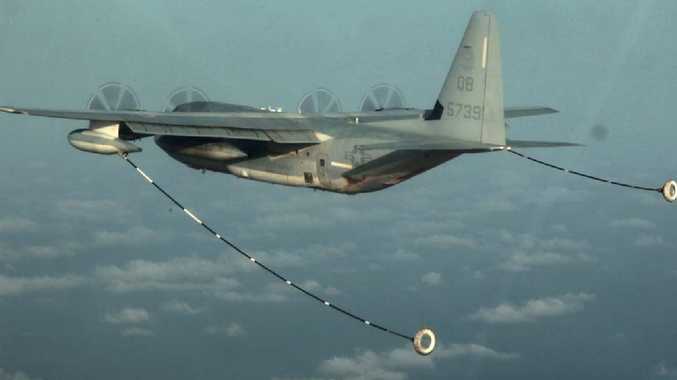 Search and rescue operations continue for a KC-130 and an F/A-18 that were involved in a mishap off of the coast of Japan around 2:00 a.m. on Dec. 6. Unconfirmed reports one of the missing Marines has been pulled from the water, alive. The rescue mission is ongoing. The smaller fighter approaches from the rear of the Hercules which has a fuel line trailing behind. An extendible nozzel then 'plugs-in' to allow fuel to flow.